From 10-20 July, local and regional governments will be in New York to share their perspectives on the implementation of the SDGs with the international community and to launch the Roadmap for localizing the SDGs. The High-level Political Forum on Sustainable Development (HLPF) is United Nations’ main platform for the follow-up and review of the 2030 Agenda for Sustainable Development and the Sustainable Development Goals, adopted at the United Nations Sustainable Development Summit on 25 September 2015. The session of the HLPF in July is the first since the adoption of the 2030 Agenda and the SDGs. The session will include voluntary reviews of 22 countries and thematic reviews of progress on the Sustainable Development Goals, including cross-cutting issues, supported by reviews by the ECOSOC functional commissions and other inter-governmental bodies and forums. On 13 July, Mayor of Istanbul, Kadir Topbaş, and Secretary for Environment for the State of Sao Paolo, will participate in a session on Vertical cooperation - local authorities and national governments working together for implementation of the 2030 Agenda. Local and regional government representatives will use the HLPF as an opportunity to call for the SDGs to be linked up with other major international agendas, particularly the New Urban Agenda to be adopted at Habitat III in October. They will express their disappointment at the limited attention paid to local ownership and implementation in the declaration and offer to promote in-depth voluntary reviews of SDG progress at subnational level to contribute to the global reporting process and the HLPF. The Global Taskforce has co-organized two side events alongside the formal sessions of the HLPF. 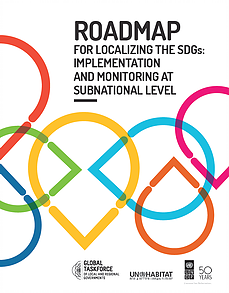 The first, on Localizing the SDGs: transforming global goals into local realities, is co-organized with UNDP, UN Habitat, UCLG and nrg4SD, will be held on Friday the 15th of July, and will see the official launch of the Roadmap for localizing the SDGs. The second, on Localizing the SDGs: Achieving Global Goals through Subnational Action is co-organized with SDSN, the Office of the Mayor of New York City, 100 Resilient Cities, UCLG, nrg4SD (organizing partners of the Local Authorities Major Group), UNDP, and UN Habitat, and will be held on Tuesday the 19th of July.